In the Philippines during World War II, an American major tries to move a guerilla unit and group of American refugees to the coast, so they can be rescued by submarine, all the while trying to avoid capture by the occupying Japanese forces. 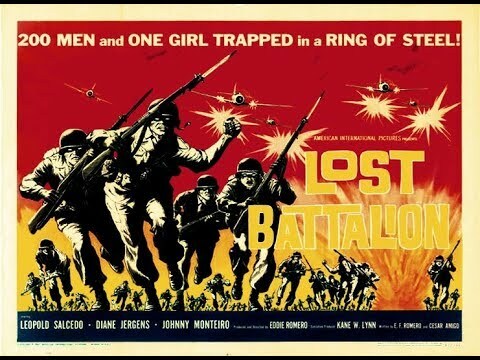 Leopoldo Salcedo played the handsome Filipino guerilla leader who is in love with a stranded American girl Kathy (Diane Jergens). .
Lost Battalion (aka Escape to Paradise) is a 1960 black-and-white Filipino war film and love story produced and directed by Eddie Romero, co-produced by Kane W. Lynn. Set during World War II, it stars Leopoldo Salcedo, Johnny Monteiro and Diane Jergens. It was later released in the US by American International Pictures as Lost Batallion, on a double feature with Guns of the Black Witch in 1962. 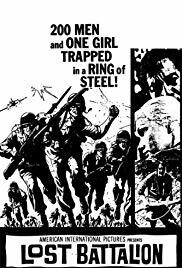 The film's ad line read "200 Men and One Girl Trapped in a Ring of Steel!"